This is a quick, nutritious and delicious dish. Great for breakfast or light lunch. Soaking bread in an egg mixture is inspired by making French toast. Herbs can always boost fragrance and the flavour of food and reduce amount of salt used. Grain and seeds contain lots of important vitamins and minerals which benefit health. 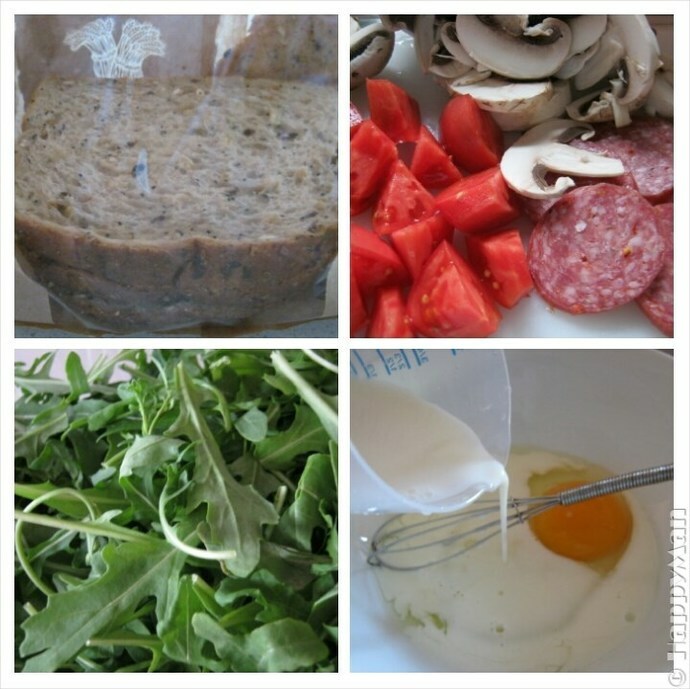 Rocket leaves are very low-calorie and contain vital anti-oxidants, vitamins, and minerals. Mushroom and tomatoes are well-known healthful foods. Salami is for boosting taste buds, you can always change to turkey salami or whatever meat/sausage you like. Mix the egg, salt, milk and some dried/fresh mixed herbs in a shallow bowl, whip them up to form an egg mixture. Immerse bread in the mixture making sure both sides absorb the mixture. In a frypan, melt 1/2 tbsp butter (or olive oil) over a medium-low heat, add in the soaked bread, pan fry each side until golden brown. Transfer to a serving plate. In the same frypan, add in the salami slices and mushroom, stir fry for 2-3 minutes until mushroom is tender. Add in tomato dices, stir fry for a few seconds. Place all cooked ingredients and fresh rockets leaves on the panfried toast, sprinkle with some salt and pepper ground to serve.